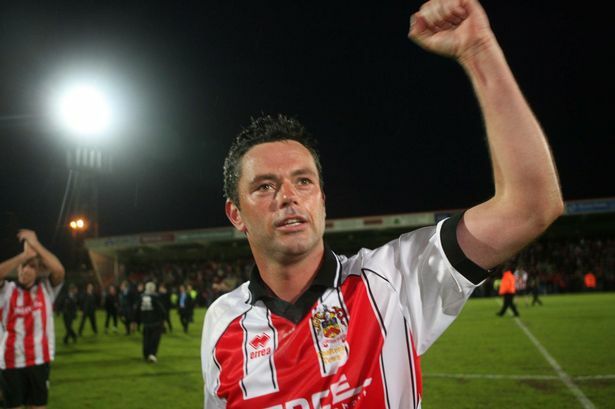 Will be visiting Whaddon Road with his new team, Oldham, on 19th April. Very interesting the EFL has cleared him to take on the role of manager on an 18-month contract given he owns 10% of Salford City and there's a chance of Oldham v Salford in League 2 next season... (Salford currently 4 points off top but on a pretty poor run). Also two ex-England players managing in League 2 in Campbell and Scholes. They obviously don't have the Lampard/Gerrard factor! The Gerrard factor, what managing a team in the Scottish Premiership. A division that Cheltenham Town have either transferred players to or from in recent seasons. Will “Sol Cambell’s Macclesfield Town vs Paul Scholes’ Oldham Athletic” be the longest ever Football League fixture read out on the BBC? Not unless ‘Jordan Forsters Cheltenham Town’ get drawn against ‘That bloke from Barnwood— Sainsbury’s Forest Green Rovers’. If you ask nicely I am sure someone will pick up your toys and dummy for you. I still think there is a clear case of a potential conflict, if Oldham and Salford are to play each other. I predict he will be there for less than one year either through loss of interest or poor results. Another factor is the prejudice towards gingers. And if you think I am making that up then let me tell you I undertook a study on the prevalence and longevity of ginger managers for my dissertation. Which incidentally is at odds with the same position for players, who are proportionately represented more than in the general population. Its not the colour of your hair that matters, its what you do with it. Despite a brilliantly written thesis my dissertation received very low marks, probably because my degree was in languages and I didn't need to write one. Any gingers post on here? RCS has this right. Ever noticed who rarely there is a reporter for Sky at any game we play? Sometimes for the better though The Eisa joke is back shame the Eisa is not. ...can you translate that please ? Sorry folks - I typed "who" instead of "how"... oh, and also left out a full stop. I'm still impressed with what I managed to write... Thank you RCS for translating. I was a paperboy at St Marks. I had to be at the shop for 05:30 to mark up the papers. If somebody didn't turn up, I had to fill in to do their round. All before I got 08:06 bus to school. I have an ‘Owzhat in a old tin. My friends have a more inferior plastic box. We love a game - played a 5 match test series during a weeek in Spain, for example. Wow that didn't last long. Paul Scholes resigns after 31 days in charge, claiming he was misled by the club. Beat me to it. What a joker. Misled. s#!t manager like the majority of the rest of the ex-scummers more like. 1 win in 7. Well I was wildly wrong giving him up to a year. Pointless PR stunt to get some Twitter followers. The modern world in a nutshell. Serves them bloody right. A nothing game for TV. I was told he was originally told that he would have a free rein in the way the team was run but the Chairman reneged on this so he left. very true, you're telling me with all the contacts PS has in football he wasn't made aware of the owners involvement. Maybe it is a case of his heart over-ruling his head. He believed what he was told by the owner but found out a leopard can't change its spots. Almost guaranteed, I'd have said. Explains his swift exit, blaming the owners who apparently knew nothing of his gripes.